Yes, it is finally time to reveal the powder room, but before we do let's take a little stroll down memory lane. I wouldn't want you to forget what this lovely room looked like before. Especially the before before. Ouch, I know your eyes are hurting. Sorry! This is actually the second look to this room, but I don't have any pictures of the original blue on blue striped wallpaper that was in here. That is the reason for this LOVELY faux treatment. The walls were so badly messed up after a week of peeling the wallpaper off that I knew this treatment would hide them. Yes, I know, more painful images, but we must get through these to appreciate the new look. Trust me. Okay, much better than the other. This was fine for the last several years, but it was time for an update. The wallpaper border was removed. I have never been so happy to see that gone! The mess is finally all cleaned up. Are you ready for the new and I hope much improved look? I know you're heart is racing! There is no easy way to take pictures of this itty bitty room, but here are the ones I got. Alright we are walking up to it. Red checked rug from Pottery Barn on sale. I decided to use a stool as a side table for the soap and hand towels for a farm house look. Little plate from antique store used as soap dish. New aged finish on mirror. Using the Pottery Barn burlap lined basket as a wastebasket. I already owned this. New bronze faucet from overstock.com. Hope it is okay to have a picture of something edible in the bathroom. My favorite painting had to go somewhere and I love the pop of red here. Mr. Savvy took the brass t.p. holder and the toilet handle and used his bead blaster and removed the shiny finish and spray painted them with ORB. They are just like the store bought finish. Sometimes the car hobby garage comes in handy. He also did the hinges on the door. I painted both light fixtures in ASCP Old White. If you look closely you will see that I painted the center of the medallion in ASCP Paris Gray. I like this much better than the original crackle finish that was on these. Mr. Piggy moved in here. The beadboard was hung at 2/3 high in the room. I like it high. This room actually feels bigger now. I will share details on the stool and mirror transformations soon. Benjamin Moore Chantilly Lace paint on trim and beadboard...already had. Trim above beadboard wallpaper under $50. 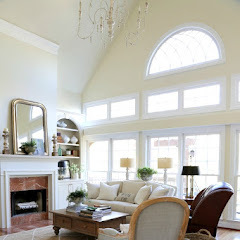 Post edit: this room is featured in the June 2012 Cottages and Bungalows magazine. It's beautiful Kim..great job, love every last detail! Wow Kim, absolutely gorgeous! I love how fresh it looks and rustic-ly elegant! Looks beautiful Kim. 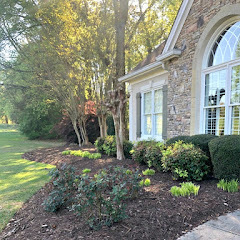 A wonderful transformation and I'm sure you are glad it's done. Kim, what an improvement! You did a great job! And if Mr. Piggy ever needs a home, send him over! Kim-It looks great! I had that same wallpaper border in a bathroom years ago too. My own was that foresty-blue-green. Love the beadboard and color on the walls! The mirror and stool are lovely; can't wait to find out how you finished them. I really love it. Great colors. 2 of my favorite decor items are the bar stool as a side table and the piggy. You did good. Kim, you have a potty to be proud of:) I love the touches of red and the farmhouse stool and hand towels. Everything turned out perfect. Was it worth the mess?? I say YES. Lovely room. Looks wonderful. well worth the effort. I love bead board in a bath room. Richard from My Old Historic House. Love the transformation Kim and love the paint treatment you did on the mirror and stool, cute idea by the way to hold the soap and hand towels! Great job!! WOW, what a big difference! Looks great and love the height of the chair railing. That beadboard is wallpaper?!?!? Looks so much like the real thing! Super job on the entire room. So pretty Kim! I love the idea of the stool for a side table. Especially with a pedestal sink. Very pretty! Great transformation Kim! It has a fresh spa like feel. I like it!! What a night and day difference! Literally! It's so bright and airy now. I love it!! ps...my mom has that same pig...she's had it for at least 20 years. She has it hanging from the ceiling of the screened in porch and I've always loved it. Fresh and simple, love it! You really are on a mission to achieve the farmhouse look, aren't you? It's a nice clean look that looks cute with all your little accessory additions! Mr. Pig looks right at home. Kim, it looks beautiful. So fresh and classic! I am familiar with the wallpaper on the floor look and can feel your pain in the transformation process! Lovely! Love this, Kim! It looks great! Kim, it looks great. Remodels are so trying, so I know your happy it's all finished. Love the colors you chose. It turned out so cute! It's looks very fresh with your new color palette. I like that blue. It's very pretty with the other colors you have in there. That was a great idea for Mr. Savvy to redo your toilet paper holder for you. I ended up having to completely replace mine! I know you must be glad to have this room marked off your "to do" list now. Your picture caught my eye at the Simply Klassic Sundays Link Party. I love your new bath!!! It looks amazing! Just my style!! It's so light and bright, Kim! What a change! Love what you did to the mirror frame. Kim, your powder room looks really great! Wonderful makeover! Love the Wythe Blue and the black door. Very nice! Love the stool idea and the high wallpaper bead board does make it look bigger in there. Wow, Kim! Gorgeous makeover! love the height of bead board. Your accessories beautiful! You and your husband did an awesome job! Kim it's gorgeous! That beadboard wallpaper looks amazing, love the color and all your touches. Piggy looks great there too! What a wonderful change Kim! Your hard work certainly paid off! An amazing transformation, Kim! Your hard work really paid off and Mr. Savvy did good too! I really love it!! Love the look of the beadboard paper. Ya'll did a great job. I want this powder room!! I love everything about it. Great job!! It's beautiful! What a super transformation! I love it! All the new elements work so well together. I especially like the apple picture. It looks wonderful Kim. Love the stool...great idea! I love the new look. It's hard to believe that beadboard is wallpaper. It gives such a clean, crisp look. It looks absolutely amazing!! Im tickled pink at home beautiful it is! I love it Kim. I think the apple pic looks great, especially with that basket from Pottery Barn that looks to be straight from the orchard! And the stool is adorable, great colors. Kim it turned out beautifully, you must be so thrilled with it all! And I love that little piggy! Kim, its just beautiful. My fave is the 2/3 height beadboard. I know you must love it. Good job! Couple of things. I think the beadboard looks like the real thing. I think the pig is perfect...and I love that you call it The Powder Room. Sounds so refined. Beautiful job and I'm sure worth all the aches and pains now that it's finished! Love it! it looks so bright in there now. Loving the faucet as well. It is gorgeous! So that isn't actual beadboard? It's wallpaper? Not sure if I read this wrong. So crisp and clean. Also, hope you will share exactly how you did that mirror. Lovely! It looks beautiful! I love the updated color scheme and bead board. I know you are happy to cross this project off your list. I am amazed at what you and your husband are able to accomplish! Amazing Kim. Powder room looks sooo good. All your details tie in so well, and then you end it telling us that is beadboard wallpaper! I could'nt believe how great that looks. We just did our masterbath this year and did high wainscotting panels and it was pain in the wain. Your bath rocks!!! Love it! I also really love the idea of using an old stool for a table there. I couldn't tell what color the top portion of the wall was. Did I miss that? The transformation is beautiful. It was a pretty room before, but now it is gorgeous! I love every decorating decision you made. I was thunderstruck when I reached the bottom and found out the bead board was wall paper! It looks terrific. I may have to try that myself. I love the use of the stool. Your choices do make the room look so much bigger (and brighter). It's beautiful! what is the wall color above the bead board? I love it! Are you kidding me???? I can't believe that's beadboard wallpaper! Amazing!!! Wow! What an awesome transformation. The powder room looks so fresh and modern. Love the way the mirror plays off of the bead board. You really did a fantastic job. MAJOR change...looks great! Love the wall color! What abeautiful finish Kim - worth all the mess! Kim, this bathroom is amazing! I love the color and the wallpaper. Y'all have been working! Wow! What a lovely transformation! Love that you used the beadboard 2/3 of the wall! Lots of hard work really paid off! Fantastic job Kim. It sure does look larger. I love the beadboard paper. Wow! What a transformation! I love the bead board wallpaper! I am going to have to get some for a little project I have in mind. You did a great job giving this room a makeover! I love how you updated the lighting! Love it Kim... your hard work has paid off! I'll have to see if I have any before photos of my BB (before blogging) bathroom. Similar paint job to yours if I recall it was some metallic Ralph Lauren paint. Egads! Mine is long gone too! Great job on the powder room! Just remember that the before may not look good now but it was in style back then! We had a lot of trouble with our pedestal sink, too! Kim, that is absolutely brilliant! I love the beadboard and the blue paint. I think the pops of red are just fantastic, but my favorite is the stool. It is totally unexpected but perfect! I think we should start is "Where is Mr. Piggy?"! Love your color choices and the bead board. It looks fantastic - love the green stool and soap dish but my favorite is that cute little piggie! I love the new look in your powder room. I love the little dish that you're using for the soap. I know you'll enjoy your hard work for a long time. Another amazing transformation! I love it, Kim! I know you're so happy you did this and have finished painting! You have the energy of the Energizer Bunny! Oh this is fab Kim! Isn't it scary when we look back at photos of how we decorated?? I still cringe at my old ones! It is a beautiful powder room, Kim! Love the bead board and the color of the wall above. I love it. That is an absolute transformation - completely beautiful. Love the crisp new look Kim. The aged finish on the mirror is beautiful. It's all beautiful and your accents are so tasteful; not overdone. Beautiful jov well dome. Love the beadboard wallpaper. My daughter used it in her kitchen with great success also. It is amazing how the paint changed the look of the light fixture. Doesn't look like the same one. The wait was well worth it, you and Mr Savvy did a wonderful job! It looks fresh and clean and lovely. The stool is perfect and I LOVE the pop of red in the pic. Your powder room has undergone quite the transformation. I really like the stool as a table and the darling saucer/soap dish. It looks so fresh now, Kim. Really darling. The stool and accessories are magazine worthy. A few suggestions - hope you don't mind. I do have to say that the picture over the toilet seems a bit too large in proportion to the toilet/room and is hung too high - you have a tendency to hang your art too high (just trying to help)....also, it is a shame that the mirror over your sink hides the beautiful molding. If you lowered the mirror just below the molding would it be too low? The bathroom goes with the rest of the house now~carrying all your colors. I love the beadboard and the height you hung it~nice job! Your powder room looks gorgeous!! 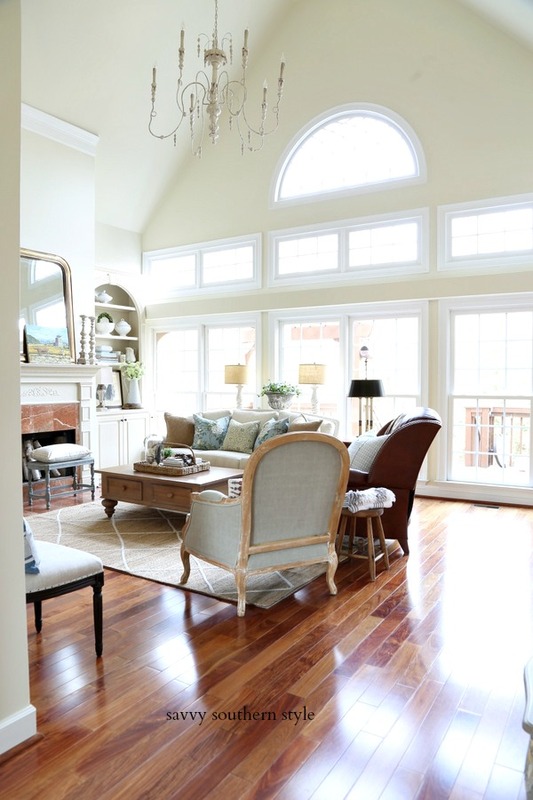 I love the high beadboard.I love your new rug too.It looks so pretty. What a transformation, so fresh. The pops of red are great and love that stool. What a clever way to hang the towels..Beautiful job! Kim, your powder room looks great! I had to laugh about the pedestal sink because ours was a stinker to install as well. Are there 2 mouldings at the top of the beadboard wallpaper? Do you recall what they are called? I'm having a fit trying to find moulding I like. Mom, since you have no reply comment instead of an email address I will answer you here. I cannot stand art hung too high. The painting is hung at my eye level and I am only 5.3. The trim is hung at 72 inches and we cannot lower the mirror it would be too low in fact we may raise it some. The pictures just don't give you the same effect as standing in the room. If you will look at pictures of high hung beadboard and trim the mirror is usually always hanging over it. Wanda, no, the trim is one piece and we bought it at Home Depot. I love how you transformed your bathroom, it is awesome, love the wains coat it makes the room appear larger, every detail down to the bar of soap on the cute plate, oh yes, the picture is great. I am following on GF, twitter fan have tweeted you post. Wow...not sure what to say that hasn't already been said. Well done! You have given me lot's of ideas...I have the same high ceilinged small powder room. I wanted beadboard, but was dreading fitting it behind the toilet and pedestal sink. Wall paper...perfect!!! Wow, Kim! I know I am repeating what others have said, but I think your new powder room is just lovely. After finishing one of my baths recently, I know this was hard work, and you've certainly done a wonderful job. Love all your colors and accents, too, and isn't it a load off your mind to have it finished? Fabulous! Love the farm house feel! Outstanding, Kim !! The "new" powder room looks fabulous ... love the paint color and how you carried the beadboard up high. Love the stool there, too !! Beautiful cottage style powder room. I love the transformation! I never thought I could be in love with a bathroom but Kim, I LOVE yours! Everything looks perfect right down to Mr. Piggy! I have to show this to my hubby so we can maybe get started on re-doing our disaster of a bathroom. Love it all Kim! I like how the shelf is reflected in the mirror. What a beautiful room! I love all the texture and your color choices are incredible! I can't wait to see the mirror tutorial! I love your powder room! I posted on my powder room update this week too! Can't wait to see what else you are re-doing! Wow Kim, what a transformation, it's great!! I love the way the rug "pops". You know I never thought of getting a rug for my tiny hall bath. Now, I will be on the lookout for a little rug. Those sinks are just a bugger to replace. We updated our little bath a year ago and that was hard to replace the toliet and sink with such little room to move around in. I love how bright and cheerful everything is now. What a fun powder room! FREE-FOR-ALL linky party going on right now! What a beautiful transformation! I love the color you used in there. Everything looks so fresh. 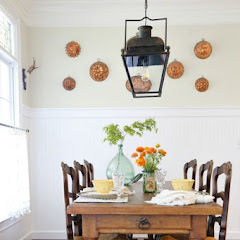 Love how you used the wooden crate and I really like how high you ran the beadboard. Gorgeous! Thanks for sharing. Just lovely! Very serene and pretty. Your attention to detail is spot on as usual. I love the beadboard wallpaper. The room is perfect. Definitely worth all the mess! I love the changes you made! Especially the paint colors and the beadboard. It's wonderful. I want this bathroom! I love the colors and all the detail. My mom who has the opposite taste of me says..."Why did she change those beautiful gold walls? "....Go figure! This is the challenge I face everyday, since our family lives with mom...all my decor is in the garage. I'm rambling...Love the bathroom, great job! It is wonderful, of course I knew it would be. I love the pops of color and the mirror is so great with your paint treatment! Love it! Kim, it is gorgeous! The transformation is incredible! You did a great job! The bathroom looks very fresh and pretty. Love the beadboard and the wall color. The mirror is also a very pretty feature. This is a fabulous transformation! oh siiiighhh... I looove it! Great transformation. Found you through BNOTP linky party. New Follower! So so pretty, Kim! What a change! I love all of your vintage decorative touches! Great job! love the pop of red too! and those gorgeous faucets. Can faucets be gorgeous? What an amazing transformation! I love everything about it! Well, all of your hard work and long hours have certainly paid off BIG time! You and your husband did a wonderful job. It is so fresh, crisp and clean! Love all of your colour choices and textures! Gorgeous! 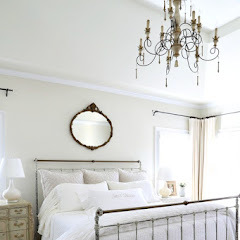 Wow, this room did a complete 180...it is so light, fresh, and bright now. The wall color and the bead board are fantastic. Very classic. Beautiful, Kim. You and Mr. Savvy are amazing. I had to come check out your powder room! I love the blue in there...and the touches of red. Simply gorgeous! What a delightful transformation. Love the stool to hold the soap and towels. Looks fantastic, where did you purchase the bead board paper ?? Wow!! This is beautiful !!! LOVE the stool idea!! And that red rug looks awesome to pull the red from your painting!! You are having fun!! Love the colors! It's much better...bet it was hard to leave that sponge paint and the border..
Beautiful~Everything, I really like the stool as a side table! Just beautiful! 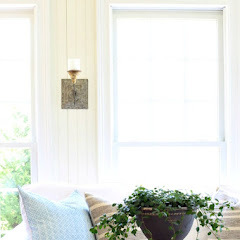 I love the blue color of paint you chose with the white beadboard. Now this bath goes with the rest of your house. Super cute. It turned out just beautiful!! Kim, this turned out so great...full of originality and personality! I love the high beadboard! SO cute! Love the paint color with touches of red! The stool really added and all of your special cute little things to give it your style! Kim, it is gorgeous! I love seeing how it has evolved over the years :) It will be featured tomorrow. have a wonerful week. I really like the new look! but wait! That beadboard is WALLPAPER??????? Where did you get it? It really looks real!!!! really great transformation! love the stool in there as table...great idea for a small space. the colors are all wonderful together and the bead board wallpaper is fantastic too. 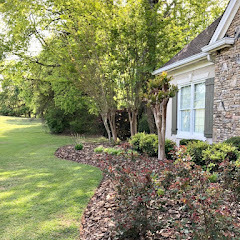 your labor of love definitely shows here...it's all cottage farmhouse lovely!! Kim, looks beautiful! I'm loving the 2/3 high bead board wallpaper ... I'm planning a similar technique in my master bedroom & bath. And thanks so much for linking up to our "Impossibilities" challenge link party! How many ways can I say gorgeous!! Simply gorgeous. I love the farm house take on your powder room! I am so amazed that that bead board is actually wall paper! Genius! I finally got my beadboard wallpaper installed in my kids' bathroom - love yours Kim. Thanks so much for linking up to my first Room Evolution link party. I really appreciate it! I've already gushed about how much I adore this room (is it wrong to adore a bathroom)?! So glad you joined our challenge! I love your toilet (I'm British. We call it a loo!!) room. You have added some really cute and clever features and I think it looks great. Well done and Congratulations on making your impossibility possible! Bravo Kim, I'm impressed that you made so many changes to such a small room. Love, love the farmhouse look. It's just charming. Love the new look. I've been wanting to try that wallpaper on the dated bar in my basement. I may give it a try now. Becky, hope you come back here for the answer since you don't have your email attached. I found mine at Ace Hardware, but they quit carrying it. I also used bead board wallpaper in my hallway - everyone thinks it's real bead board. I love how you put the stool next to the sink with the towel and the bar of soap - also love the rug..